IT HAS A 'KANGOL' MACHINE EMBROIDERED FRONT LOGO & HAS A DEEP CUFFED HEM. GREAT LOOKING QUALITY HEADWEAR. Kangol black and white XL/L flexfit wool snapback fitted hat - VERY GOOD COND. Condition is Used. Dispatched with Royal Mail 1st Class. New unworn hat, been stuck in a box for ages. KANGOL Bermuda Bucket Hat Size Small / Medium. Condition is New with tags. Kangol Bucket Hat - Blue - Small/Medium. Condition is Used. Dispatched with Royal Mail 1st Class. 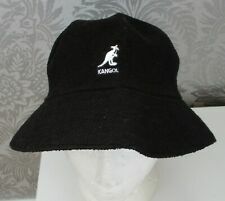 Original genuine Kangol Bucket Hat size Medium/Regular. No logo. Condition is New with tags. Dispatched with Hermes. A fab lot all kangol labels except the purple one. IMPORTANT . Made from 100% polyester, this cream small shaped hat would be ideal for your next special occasion, the races or even as a quirky bridal piece with netting detail. Formas delicadas y carácter fuerte. 55% Lana, 45% Chlorofibre. Banda elástica de punto para mayor comodidad. Lavar a mano. Boucle Bucket Hat by Kangol. Terry cloth design. 50% Modacrylic, 35% Acrylic, 15% Nylon. Stitched rim. Headband: 100% Nylon. New unworn hat, been stuck in a box for ages. Size Large. 60% Polyester 40% Chlorofibre. Unisex Earlap Hat by Kangol. Colour: Black. Grey Wool with Textured surface Snowball Pull-on hat by Kangol. One Size - 100% Wool. Kangol Wax Cotton Spey Bucket Hat. Great looking classic bucket hat from Kangol. This model is made with 100% wax coated cotton and lined with soft flannel to keep your head dry and warm. Size: Large.